This Christmas, the Sanderson hotel has been transformed into a Willy Wonka inspired chocolate factory. In keeping with the hotel’s tradition of celebrating the non-conventional with their Christmas tree, the Willy Wonka theme is showcased in an edible, rainbow tower in the lobby. 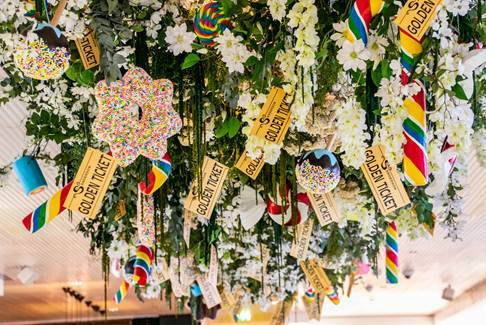 Over two metres high and constructed from stacked vintage sweet jars stuffed with colourful candies, the tree is lit by glowing fairy lights and topped with a giant rainbow lollipop, bringing Roald Dahl’s magic to the heart of the hotel. The Willy Wonka theme can be enjoyed by residents or visitors. However, a ‘Golden Ticket’ room package includes a standard room and choice of golden ticket upon check in. Depending on the envelope chosen, guests can win exclusive prizes ranging from a complimentary breakfast or bottle of champagne to a Mad Hatters Afternoon Tea for two, Champagne flight & canapes in the Purple Bar for two, or even a complimentary night’s stay. Sanderson’s chocolate factory will be open to guests, whether or not they hold a golden ticket, from now until 4 January.